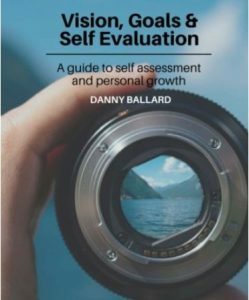 “Vision, Goals & Self Evaluation: A Guide to Self Assessment and Personal Growth”, by Danny Ballard. External factors can certainly impact how we move forward, but recognizing that the most powerful place from which we create change happens inside, empowers us in management and strategic performance. This workbook is designed to help you get clear about who you are, how you show up in the world, and the steps you choose to take to live the life you really want. In order to live the life you want with fulfillment and purpose, you must have a vision. A vision is a plan, a mission, and a direction for life. It is seen in your mind in vivid detail and your subconscious mind works endlessly to achieve the desired result… The purpose of this workbook is to help you uncover the vision you have for your life and support you in coming up with practical steps that you can take to achieve your dreams and goals. As an adjunct support to Danny’s book, I encourage you to purchase my hypnotic mp3, “Re-vision Your Future”. Danny will be speaking on “Vision, Goals & Self Evaluation: A Guide to Self Assessment and Personal Growth”, on January 23, 2018, at the DTC Beer, Buddies, and Better Health, 6:30 p.m., at Zane’s Italian Bistro, 8101 E. Belleview Ave., Denver, CO 80237. Beer, Buddies, and Better Health is a fun, energetic, co-ed group for anyone interested in learning and sharing about better health.